The essays in this collection signal a new relationship between anthropology and the study of art. The authors explore the boundaries and affinities between art, anthropology, representation, and culture, casting a critical, ethnographic light on the art worlds of the contemporary West and their "traffic" in non-Western objects. 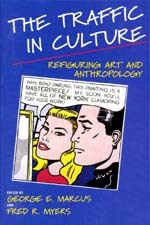 Starting from the premise that the traditional anthropology of art has been developed within categories and practices of Western art worlds themselves, this volume develops a new framework for understanding how western art—its avant-gardes, scholars, commentators, and collectors—have appropriated anthropological subjects like the "primitive" and the "exotic other." The success of Australian Aboriginal acrylic paintings in the New York art world prompts Fred Myers to explore the circulation of indigenous art in the international market. Steven Feld looks at the contemporary world beat music scene and the commodification of remote music cultures. Carol Vance takes on the contentious struggles over art, censorship, obscenity, and the National Endowment for the Arts in the United States. George Marcus looks at the meaning of new, oppositional artwork in the context of the institutionalization of the avant-garde and postmodernism more generally. In contrast to a previous anthropology of art concerned with representing non-Western objects to Western audiences, this volume uncovers the practices and processes that drive the Western art world itself. George E. Marcus is Professor of Anthropology at Rice University and the coeditor (with James Clifford) of Writing Culture: The Poetics and Politics of Ethnography (California, 1986). Fred R. Myers is Professor of Anthropology at New York University and author of Pintupi Country, Pintupi Self: Sentiment, Place, and Politics among Western Desert Aborigines (California, 1991). Molly H. Mullin, The Patronage of Difference: Making Indian Art "Art, Not Ethnology"
Hal Foster, The Artist as Ethnographer?